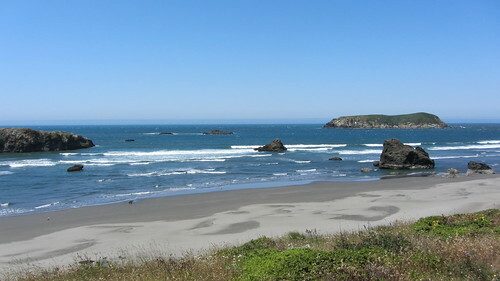 Hoping to make it to Crescent City for a hotel stay, we were happy that the winds blew us down the coast all day. We enjoyed some nice ocean vistas along the way. A highlight was definitely the “Welcome to California” sign. Many tourists pose in front of this sign and we didn’t have to wait long before someone stopped and offered to snap our photo in front of it. Low: We followed the Adventure cycling route through Crescent City. It took us on a meandering scenic tour of Crescent City. We were tired at the end of a long day, and just wanted to get to a hotel. Should have just ridden the highway. 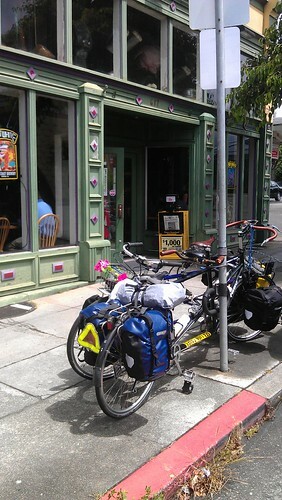 We had heard stories about the Crescent city climb from Todd and other bike tourists. Lots of traffic, logging trucks, narrow shoulders, and blind corners: bike tourists least favorite conditions. 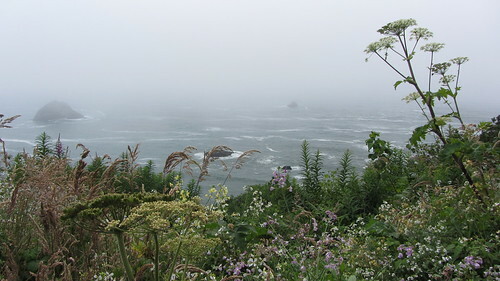 A friend who rode the coast the summer 0f 2011, said the climb out of Crescent City was her scariest day of the trip. Needless to say, after the Lincoln City experience, I was dreading the Crescent City climb. But I’m happy to report, it was uneventful. We got up early (for us) and were on the road after a quick breakfast in the hotel. Maybe traffic was light because it was Sunday morning? I’m not sure, but all in all, it was not bad. We ate lunch at the entrance to the Trees of Mystery tourist trap. Thankfully the kids were happy just climbing around on Paul Bunyan and didn’t ask to take the tour. Paul Bunyan cracks jokes and makes comments about the people milling about through a loudspeaker in a Tim Allen style voice. The kids thought he was hilarious! We lingered longer than we probably should have, delaying our arrival at Elk Prairie campground until dinner time. 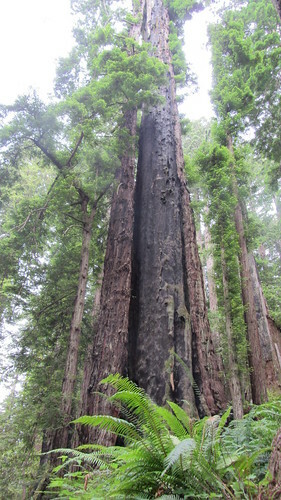 Once inside Elk Prairie State Park, we stopped and took a short walk through a grove of Redwoods. Wow! I’d been through this area a number of times in a car, but it’s 1000 times better on a bike. So beautiful! We arrived at the campground entrance and paid for a hiker/biker site at the booth. The ranger commented about our family on tandems and asked where were were from. When we told her, Seattle, she got all excited and told us there was another bike touring family from Seattle staying in the park! We couldn’t wait to meet them! Low: The last stretch of riding took forever! Foggy uneventful day of riding between Elk Creek campground and Arcata. Once we arrived in the outskirts of Arcata the route followed pleasant, low traffic roads through some farming communities and then an unpaved bike path into town. We ate dinner in Arcata and then pedaled out of town to the KOA outside of Eureka. 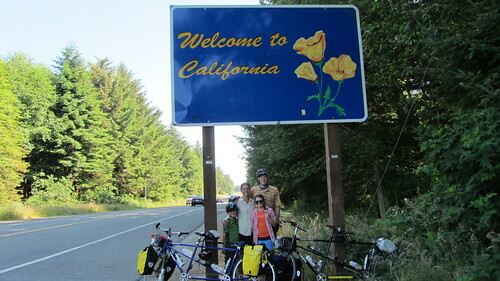 We were happy to learn that our new friends and fellow family bike tourists from Seattle were staying at the KOA too! We got complacent with the days and days of sunny weather this past week and didn’t bother to tension the tent before we went to sleep. Bad idea. A thunderstorm passed through Eureka during the night and we woke to wet sleeping bags, wet clothes and Anne’s phone sitting in a puddle of water. Ugh. Since we were at a KOA and they have a laundromat and a store, we were able to throw the sleeping bags and clothes in the dryer and the phone in a bag of rice we bought in the KOA store. We went back to our site to pack our tent and get a hotel for the night in Eureka. I visited the sleeping bags and clothes a few times, adding quarters to the machine but I wasn’t really worried about our stuff. Another bad idea. Someone rifled through the dryers and took some of the kids clothes. Why? Why? Why would someone do that? High: hotel stay in real beds!